HomeHome 1 Blog UpdatesDon’t underestimate the possibilities. Yesterday Arden and I witnessed another Nick miracle. I took a picture. Over the weekend I had been playing Bananagrams with friends. It is a game where lettered tiles are used to spell words. Nick was struggling to pick up the tiles. We searched the internet and discovered that there is a similar game with thicker tiles called Appleletters by the same company. It was created for younger readers. We ordered the game. 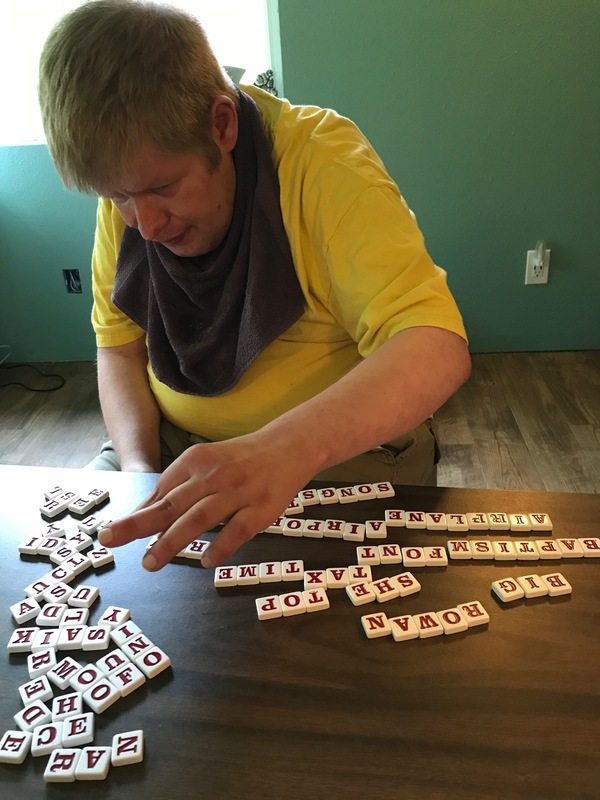 It arrived on Tuesday and Nick spent over 3 hours making words with his new letters. He loved it and was very proud of himself. I thought back to when he was in elementary school. Many of the school district professionals firmly told us that we were being unrealistic to insist that pre-reading skills were on his Individual Education Program, his IEP. Somehow we just knew that reading was a possibility for Nick. He was 17 before he began reading, many many years later, but each year we would fight with the “professionals” about what we wanted in his school program. Not only can he read, he can spell. Those two skills are not always in equal balance in people. He enjoys making words, it is fun for him. Recently it has been popular to say that it takes 10,000 hours to achieve excellence, particularly in a sport. I believe that it takes many hours to develop any skill. Very few of us are naturally talented, most of us work hard to learn things. It is important to keep working on things. Nick is tenacious and has worked hard to learn and to accomplish skills. I am very proud of him. His stubborn unwillingness to quit can be frustrating at times when I have wanted to move on to something else, but he has taught me to keep on trying. He is a great example. Kudos to Nick! I’ve watched that look of fierce and abiding concentration on his face many times. He never ceases to amaze me with his tenacity! Way to focus, Nick!